House rich and decorating poor? Here are more Decorating On A Dime ideas from our piece “Decorating Your First Home On Your Last Dime.” Time to kick up your kitchen! Turn Everyday Objects Into Objets D’Art: Ordinary items can add extraordinary charm when displayed with flair in your kitchen. Parade your vintage Thermoses across the tops of your cabinets. Restaurant-sized cans of frijoles refritos make bueno bookends for your cookbooks. For your kitchen walls, frame colorful 60s cookbook recipes and that ambrosia salad will finally be a masterpiece! Spice Up Your Cabinets: Horrible cupboards, but no budget for a full facelift? Rejuvenate them with a coat of paint and updated hardware. Get mod by stenciling a six-inch street number on each door; a stencil set costs about $13 at OfficeMax. (You can tell your guests, “The goblets are in cabinet 7.”) For free-form fun, try chalkboard paint from the hardware store. You’ll have the perfect place to write your grocery list. Display Your Wares: If your kitchen is cramped, think outside the pantry for storage. 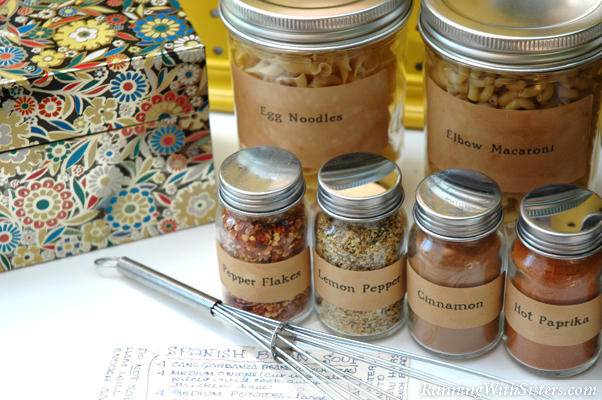 Unclutter your cupboards by displaying your pasta and spices in clear jars with antique-looking labels. A metal grate meant for a Weber grill can be hung from the ceiling as an inexpensive pot rack. 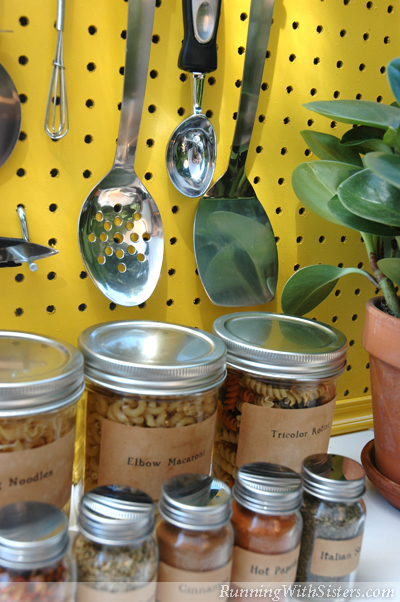 Turn your kitchen into a culinary workshop by hanging your cooking utensils on a pegboard from Home Depot. Talk about form and function! Where did you find the jars. Hi Kathleen, These jars came from IKEA. But you can use any jars you like!